One of the very first fabric designers I ever actually noticed was Jennifer Sampou. I'd only been quilting a year (almost 15 years ago). My stash shopping was very limited because I was in grad school with limited time and money for quilting. But after a few purchases I started to notice the names on selvages. And what I noticed was that most of the fabric I purchased was from Jennifer Sampou. I filed that fact as interesting and kept quilting. Fast forward to two years ago and I am at Quilt Market. And guess who has a booth?! It was my first total fan girl moment. I briefly introduced myself and marvelled at the coincidence that Jennifer is married to my publisher. The next Quilt Market I stopped by Jennifer's Booth to say hello and we ended up chatting for well over an hour about everything - motherhood, fabric, creativity, colour, sewing, books, marriage. My first designer crush is truly a kindred spirit. Since then I've truly enjoyed the opportunity to play with Jennifer's latest fabrics. When you listen to the designer discuss their inspiration for a fabric line the fabric itself takes on a new light, almost quite literally. Jennifer's neutral palate is inspired by her love of things that shimmer - feathers, shells, crystals, and even fools gold. The fabric itself is metallic or pearlescent (depending on your own description). When my Shimmer fabric arrived in it was a very special shell from Jennifer. Have I mentioned how much I love shells? I have a casual collection of the shells I pick up from every beach I find. Just the interesting ones, the pretty ones, even the cracked and beat up ones. They sit in bowls and jars throughout my house. I had a completely different project in mind before the fabric and the shell arrived. At the same time, my girls took over the table setting duties. Every night they raid my shells and rather carefully place them around the table. They might forget forks, but the shells are always there. The fabric I requested - shocker - were all the light prints in the line. You know me and low volume. But rather than play with a pattern I already had or even experiment with another inspiration, I had to incorporate my shells. 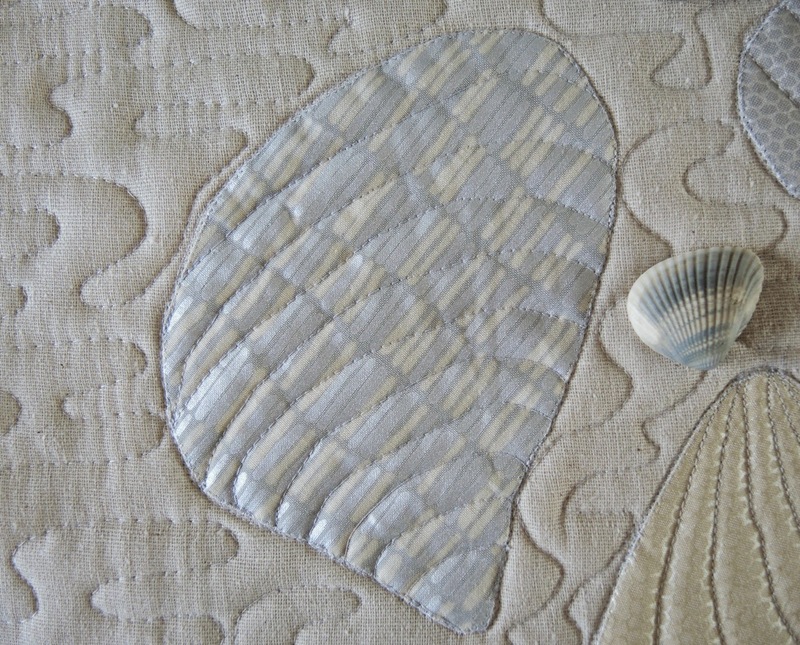 Each shell is appliquéd on the osnaburg background. I wanted it to feel like a scattering of shells on your feet at the beach. I used the technique I use to create and sew my appliqué circles. 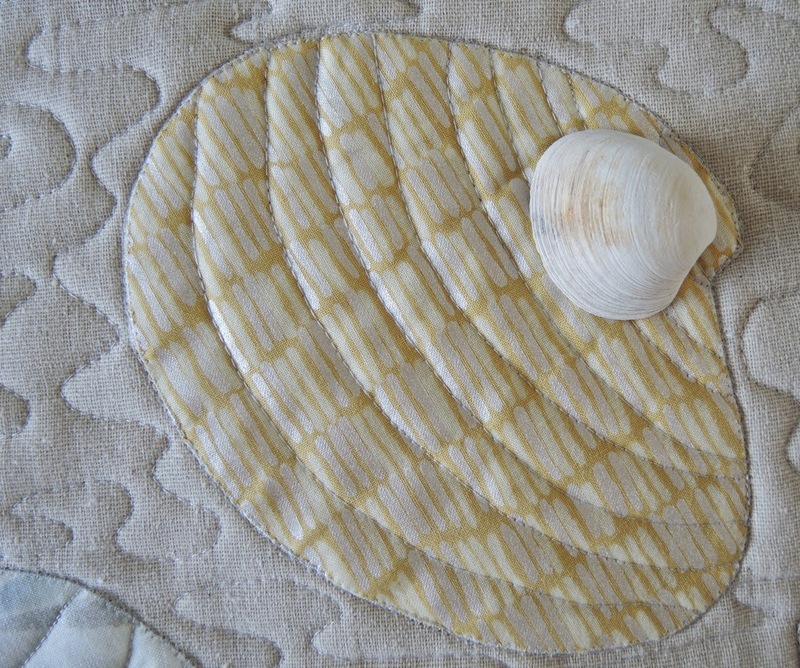 The shells come alive, or at least more realistic with the simple quilting. For the back of the table topper I improv pieced the scraps into a slab, with just a bit of aqua added for fun. It's almost too pretty to use on the table, but my shell loving girls think it is perfect. 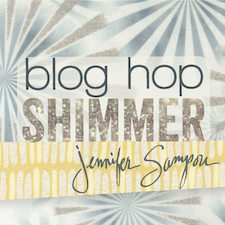 This is my stop on the Shimmer Blog Hop. Check out the other posts and all the fun things people have made with Shimmer. 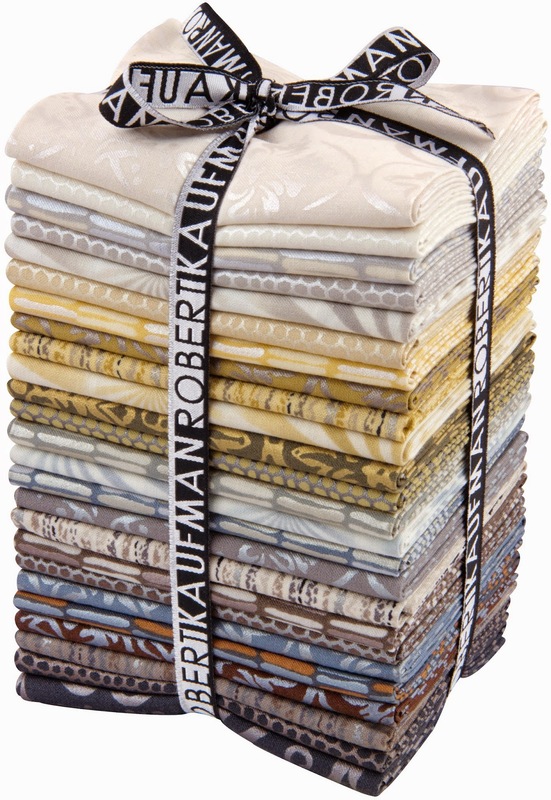 Robert Kaufman and Jennifer are sharing no shortage of inspiration with this pretty fabric. Leave a comment here for a chance to win a Shimmer charm pack. It will be perfect for your own shell project, among others. Tell me about your favourite beach. Giveaway open until midnight MST on Friday April 18. Oh, that is gorgeous. My daughter would love your table runner too. She is a beach lover. My favorite beach is in Panama City, Fl where I used to live. I'm a huge fan of the aqua blue water in Mexico. And that white sand....thanks for the give away. Any beach in Maui. I'm not picky. I very much enjoyed reading your post... interesting!! Love your shell runner a stunning centre piece! So fresh. I love it. Loving the blog hop. finding so many new blogs to follow. I'll definitely be visiting your blog again. 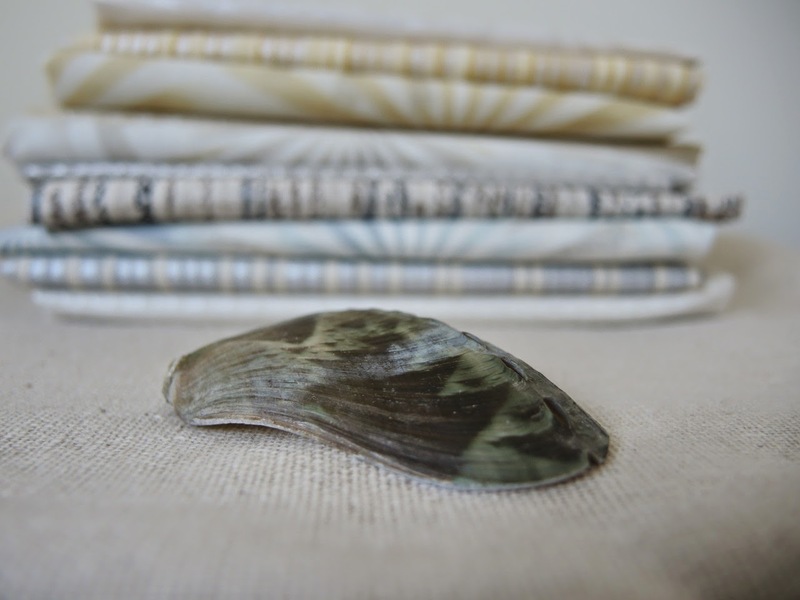 Love the shells made with this fabric. So pretty. Thanks for the chance to win some. I have had a lot of Jennifer's fabrics in my collection over the years too. I became aware of her name in the mid 1990s and searched for everything she designed. I like your table runner. I'm not much of a beach person and haven't been to the beach in years. When I was young, I used to go to the beach below the bluff in St. Joseph. I grew up going to South Padre Island with my grandparents in South Texas - lots of shells and warm water. Now I go to the outer banks in North Carolina, usually in the winter - not so many shells and usually in the winter so there's a wind, but it's starting to feel like our "home beach". I love this table runner. I live in the mountains but seek out beaches whenever I can and have shells all over my house. What a perfect way to use this fabric! The shell detail is exquisite what a treasure this runner is! What a great addition to the family table! Love how the textures are so shell-like! My favorite beach is where I was born in Digby Nova Scotia. I have lots of shells from there! I love your table runner. My favourite beach is Point Pelee, a national park here in Ontario. So much fun and tons of things to see, living or not. The boardwalk is a nature lovers dream. 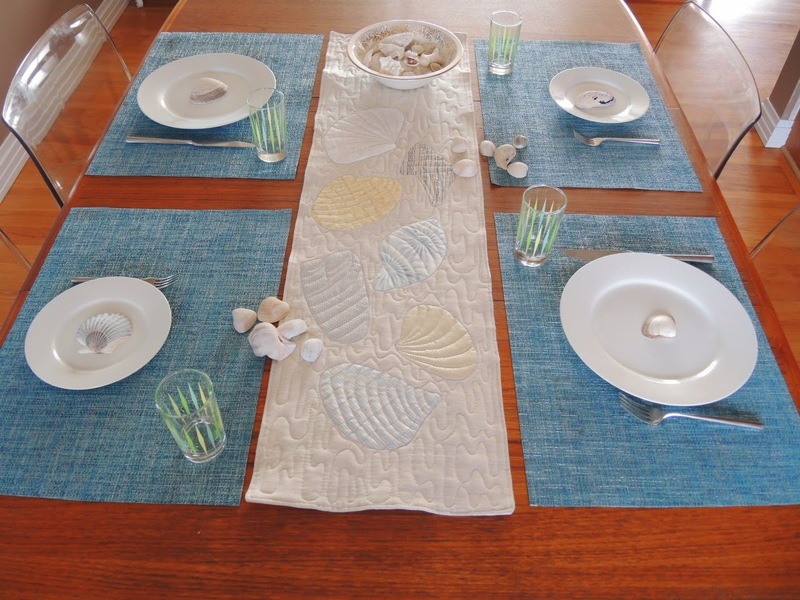 I like your shell table runner, the fabric really helps show the patterns of the shells. I have a small shell collection myself, so I love your table runner. I love this idea for a table runner! I'm a shell collector too and Shimmer is perfect for this. I used to live near Lawrencetown Beach in Nova Scotia. We had great fun body surfing in the waves there. Love your table runner ! Shimmer looks so good in your shells! I love your shells!, love the shimmer fabric also. The shells look awesome! Gorgeous! What a great table runner! My favorite beach is Huntington Beach CA. My dad took me to the ocean for the first time. It was cold that day so we just flew a kite on the beach. It was a rainbow kite that had about six sails. Love your beach-themed table runner. Those shells look awesome, the quilting definitely makes them pop. Its not crowded and has a good shore for kids to play. Favorite beach is in Maui. Oh, just beautiful! I love the way you outlined. Gorgeous! I think my favorite beach was Nag's Head. We aren't really "beach" people, but my husband and I lived in Virginia for a year and went to Nag's Head and had such a wonderful, memorable time. So beautiful. I love your table runner. What a great use of the Shimmer fabrics! My favorite beach is any beach in Hawaii…I like the warm water and great waves, and snorkeling almost anywhere there! This is the first table runner I have seen that I would like to make....great idea! My favorite beach is the one back home where I grew up. The water never gets very warm, but the sand is almost white and there are a lot of sea-shells looking just like the ones on your table. My favorite beach is any that I can have to myself - just waves and winds and birds. 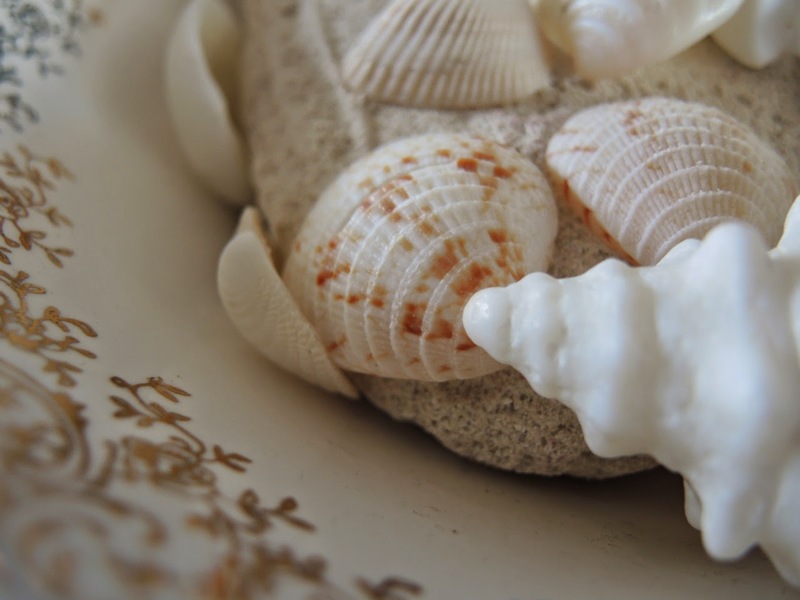 Your seashell project is lovely! Love your table runner and the creativity of your shell loving girls! Thanks for sharing and the chance to win. Your table runner is beautiful. So creative and imaginative! Such a pretty runner! I may need to make one for a friend's beach house . . . I spent most of my life in Fla and will return to visit family for Easter. This piece is just gorgeous. Love your table runner and it is pretty enough to use on the table!! I am totally smitten - I love these fabrics. I must now find out whether I can buy them in England! Love your table runner!....my favorite beach is Assateague National Seashore in MD. My family has camped within a short walk of the beach. Mostly empty of people. The ghost crabs are fun to chase after the sun is down. Your table looks prettier than y beach at Lake Erie. very creative. My favorite beach is here in Maine. At our favorite (and now closed for condo development--sniff) campground, you could sit on the beach at night at the firepits made of giant boulders thrown up on the shore during storms. During the day you could lounge on these same boulders and watch the lobster boats come and go. Maine--the way life should be! Fabulous - I love shells too and I have a large collection of tiny European cowrie shells, all collected on my favourite beach on an island off the west coast of Ireland! 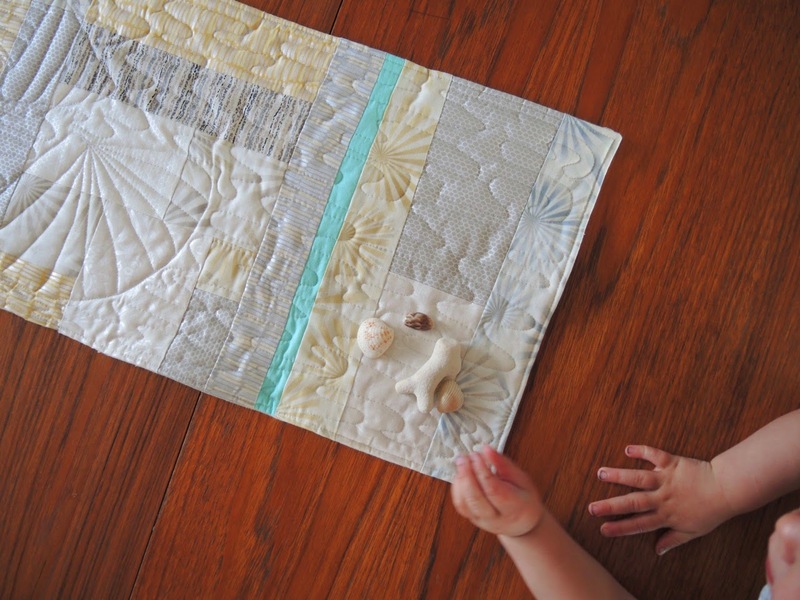 I love how this fabric is sewing up on the blog hop, and the runner is wonderful. My favorite beach is Sand Beach at Acadia National Park in ME - very beautiful but way too cold for swimming. I heart this fabric. I have already put it on my wish list! Sadly, I've never been to the beach. I would love to make your table topper though, love the shells. Love the Hawaiian beaches. The water is so clear. Your table runner is so lovely I am making my way through your fabulous Craftsy class, so this fabric would be amazing to do some circles with! I don't have a particular favourite beach, but if there is sun and sand, I am a happy girl. Thanks for the giveaway. I used to live in Washington and I loved the beach on the Puget sound. We lived about a mile away and would go see the tall ships when they came in and other fun events on the beach. My favorite beach is Lily Lake beach. Love the table runner. Also love the chance to win this fabric. Matsche.christine@yahoo.com. I like Nanny Goat Beach on Sapelo Island. You can't get there unless you have a legitimate reason to be on the island, so it's deserted! Love your shell story. I also have a collection in jars and on shelves in my home. How wonderful to capture the look with fabric. My favorite beach so far is the one in Sarasota, Florida that I went to when I was 17. It was so pretty and white sand was so beautiful! Thanks for the giveaway! Cheryl, Pacific beach where Nautilus shells thrive, "the spiral of life"
Their pearlesence shimmers like Shimmer. The aqua stripe gives a beachie look to the runner. No beaches in Kansas. I have been to Daytona Beach, it was wonderful. Wow! Your runner is just beautiful. My favorite thing about the beach is just being near the water. I love listening to the waves. I love Jacksonville Beach, FL especially in the winter when a nor'eastern blows through!! Really pretty table runner. My favorite beaches are all around Maui but it's been way too long since I've been there. I love Galveston Beach - it's where my now husband and i had our first kiss! I love your quilting and design on this quilt. It's so pretty. Easy question. My favorite is Clearwater Beach. It is where two of my children chose to be married and the place that I can witness my grandchildren play and grow. My favourite beach is Long Beach on Vancouver Island. It's the most wonderful place for beach combing and shell collecting! My favorite beach is in Oregon! Sandy beach that is so awesome. The beach in my town - Bennett Beach. In the spring when the water is low one can walk for a long way. As the water comes up through the early summer the waves become great for keeping the water warm and some fun, if very tame, body surfing. By the time August rolls in there is usually no beach front left. I love this. I am crazy about seashells so I will need to make this for myself. I love the wild, windswept Northumberland beaches... but I'm biased, its where I live! What a lovely project for the fabric! To be honest I don't have a favourite beach. I do like to collect shells though. I love all beaches. Thanks for the opportunity to win! Gosh the shell quilting looks superb on that runner. Such delightful fabric and perfect quilting designs too! The very best beach Ive ever been on was on the then RAF Gan, in the Indian Ocean - which was reinvented to be an expensive but tranquil holiday destination - the Maldive Islands! The islands are beautifully remote with the most beautiful beaches. As Aircrew back in my youth, we crews would stay there for either 3,5 or 7 days as our aircraft made its way to Hong Kong. You have no idea how much I miss that job!! My favorite beach is the one at a nearby local park along a river. I love to stand a watch the water go past. My husband and I spent time in Waikaloa on the Big Island in Hawaii. We're not much for sitting on the beach but truly enjoyed the walk along the shoreline and in the area around it. There are many interesting lava formations. I don't have a favorite beach yet, but I love shells. I can't wait to see this fabric in person. Our favorite beach is Agate Beach in Haida Gwaii! My favorite beach would have to be in Petosky, MI. I remember going camping with my family there growing up and walking along Lake Michigan looking for petosky stones. I can't wait until my daughters are older and I can share this tradition with them! My favorite is Bean Hollow State beach it's a pebble beach located halfway between Santa Cruz and Half Moon Bay on Hwy 1 in California. i love to visit my BFF at Three Arch Bay in Laguna, So. Cal. private beach, so relaxing...thanks for the give away! My favorite beach is in Clovely, NSW It's just a walk down the hill from where I lived while in Australia years and years ago. My family's favorite beach is Napili bay in Maui. We rent a condo where the sliding glass door has you walking out over the grass and to the beach where you can sit and watch Molokai across the water. We have some good memories from there. Thanks for hosting this giveaway. Those fabrics look wonderful. Beautiful table runner. I am collector of shells as well. My favourite summer beach is the one right off our front deck. But when it is frozen my favourite beach is one with sunshine,warm waters, soft sand,and a light breeze. That means a winter vacation! Thanks for the giveaway. The shells are beautiful! Can't wait for this fabric. Love your work!! I live by a lake so I am more a fan of the rugged shoreline that I see out my windows. This charm pack would be so much fun to work with! My favorite beach would be wherever I'm at on a beach! love them all! Beautiful fabric too! I have been to many beaches in the Caribbean but my favorite beach is Pensacola Beach in the Gulf of Mexico. Such an elegant tablerunner. It's stunning. My favorite beach is ANY beach. The runner is lovely. I had a huge shell collection as a kid - mostly from Florida (both sides) and North and South Carolina. Hilton Head is really relaxing. Thanks for the opportunity to try these fabrics. What a perfect project! My favorite beach is probably Moonstone Beach in Humboldt County near where I went to college. There are so many neat rocks, and Humboldt beaches are almost always great places to find secluded spots. Another shell lover here. I brought some home with me when I visited the Bahamas. I love your table runner. I need to make one for myself. The beaches in the island of St. John. We spent our honeymoon there almost 16 years ago. I've always wanted to check out the Hawaii beaches! Wow! I love the appliques! They are amazing! I have been working on applique techniques. This would make a great project. gorgeous fabric. My favourite beach is in Devon here in England, it's a little cove. OK so we don't often get beach weather but I wish I lived nearby so I could walk on it in the evenings. I love your table runner. It's a very clever design, the quilting really makes it pop. I dont have any beaches nearby, going to the beach is a very rare treat for me. Your table runner is beautiful. Love the fabric. Ohh la, la I love your shimmer table runner with shells. Gorgeous. My favorite beach is probably on the Big Island of Hawaii, at the Mauna Kea Beach Hotel where my hubby proposed to me many years ago. Beautiful beach with many memories. We found some giant seashells on an island off the coast of North Carolina. It's my favorite. Love the shells! My fave beach is the Florida Panhandle, actually from Orange Beach, Alabama to about Santa Rosa Beach, Florida. So many happy memories! My favorite beach is in Marblehead, MA. There's a giant rock formation with tidepools filled with critters, easily accessible and just beautiful. My favourite beach is Sugar Beach in Maui! My favorite beach is St. Petersburg beach in Florida. My favorite beach is the one I have been going to all my life -- Stinson Beach just north of San Francisco. Although the water is coooold and dangerous, it is a great place to take a long walk next to the water. My favorite beach is wherever my imagination takes me. Thanks for the chance to win. I love the low volume prints in this quilt. It reminds me of my time in Florida. Love your table runner, the shells are so pretty, your appliqué skills are impressive! What a great idea... Love the seashells! 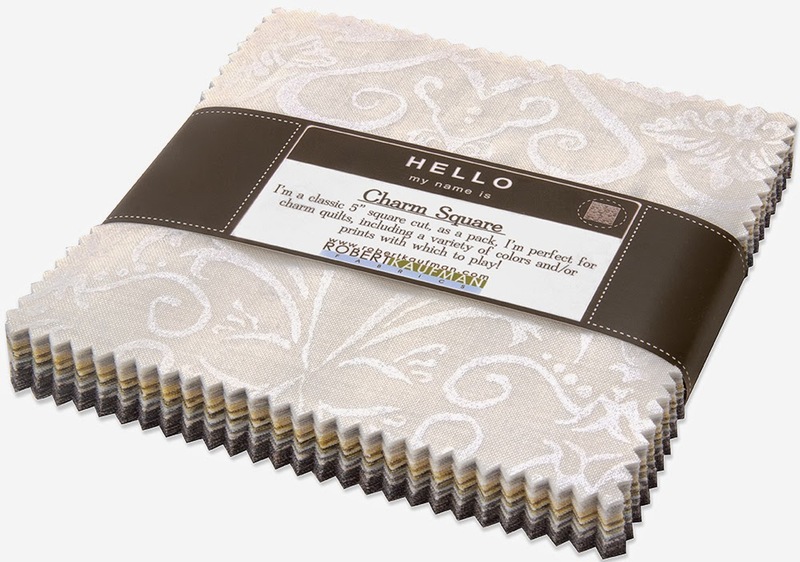 We enjoy the gulf-gulf shores or Panama City beach...thanks for a chance to win some fabric! I love the shells and this makes your quilt unique. Lovely tablerunner Cheryl! Thank you for sharing your work and your helpers creative table setting! Too nice for the table? Absolutely not! Your table looks spectacular! Love your runner; and the color of the placemats is just yummy with it! What a great project to make with those lovely fabrics! What an elegant table runner. And a marvelous collection of fabrics. Love it! Don't know why the unknown. I'll try again. Love the fabrics!!! My favourite beach is Skaha in Penticton BC...my husband and I went there each with our own families as children and now we take our kids almost every summer (we live in Edmonton). What pretty and elegant fabrics. Thanks for the giveaway! I love anything to do beaches, thanks for sharing! I'm actually not a beach person, but a few years ago I won a trip to Satellite Beach in Florida. It was in October and just beautiful! The beach was almost empty--just perfect! I'd love to go again. HELLO,we love beaches! These are such neat fabrics! Thanks for a winning chance! Don't enter me. I just had to say how much I love Shimmer in the Shells! Genius and so pretty! Great idea, beautiful projects. These fabric are so nice too. Thanks for putting my name in the hat for the drawing. My favorite beach is Newport Beach in Orange County. Clean sand, nice waves, good snack shops, fun little shops to walk by, surfing movies to watch! Good memories! O-o-o-h! 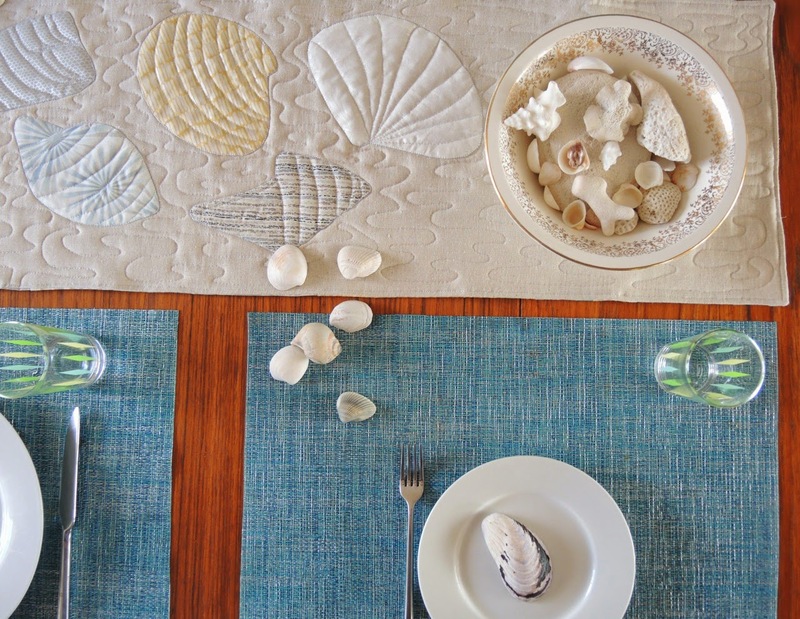 I love your shell table runner! The Shimmer fabric was absolutely perfect!!! I would be thrilled to win some of this gorgeous fabric. We have beautiful beaches here in SC. I can't pick just one, but we love Garden City. Normally I hear metallic fabric and something tacky or cutesy comes to mind, but these are really elegant. My favorite beach is Bali. Bali's in Indonesia, which is the country where I'm from. I went with my family once, I love the beach but moreover the people there! I absolutely love the sea shell idea. I can just see all the sparkly shells on the beach when I look at your piece. Love the shells! The best beach I ever visited was in Sydney, Australia, but I can't remember its name! My favorite beach is Longbeach; me and my husband have spent some really good times there.